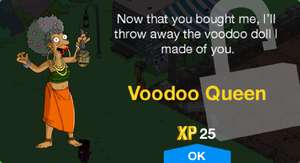 The Voodoo queen is a woman who uses and sells voodoo equipment. Bart goes to see her so that he can get his art teacher sick. She gives Bart everything he needs then asks him whether he wants a paper or plastic bag. She then gives Bart his stuff and he runs out. 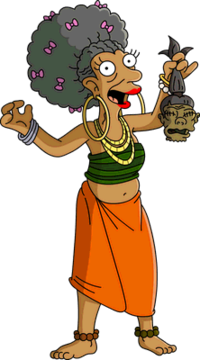 This section is transcluded from The Simpsons: Tapped Out characters/Treehouse of Horror XXIX. To edit it, please edit the transcluded page. Modified on November 17, 2018, at 17:27.